I have been a fan of novels written by Agatha Christie since the age of the thirteen. Mind you, I do not like all of her novels. But there are a handful that have been personal favorites of mine for years . . . and remain personal favorites even to this day. One of those is the 1950 novel, “A Murder Is Announced”. Superficially, the plot to the 1950 novel seemed pretty simple. During Britain’s post-World War II era, a handful of citizens from Chipping Cleghorn read a notice in their local newspaper announcing that a “murder is announced” and would take place at Little Paddocks, the home of a spinster named Letitia Blacklock. Many of Little Paddocks’ inhabitants and local neighbors assume that this “murder” is actually a game in which a fake murder occurs and the party guests have to solve it. However, Miss Blacklock never placed the advertisement. Realizing that some people might pay a visit out of sheer curiousity, she makes arrangements for an impromptu party. Not long after the party begins, the lights inside Little Paddock immediately go out. Someone brandishing a flashlight announces a stickup and demands that everyone raise their hands. Seconds later, several gunshots ring out. When the lights are restored, Miss Blacklock and her guests discover the dead body of a young man on the floor. Detective-Inspector Dermot Craddock is assigned to solve the case. Before long, he finds himself being assisted by the story’s leading lady, the elderly amateur sleuth, Miss Jane Marple. The latter was staying at the hotel where the dead victim, Rudi Scherz, worked at. And she eventually arrived at Chipping Cleghorn as a vistor of one of Miss Blacklock’s guests. After a bit of investigation into Scherz’s past as a hotel clerk and a petty thief, both Miss Marple and Inspector Craddock come to the conclusion that the killer had intended to kill Miss Blacklock and merely used Scherz to set up the crime and be used as a patsy. All right. Perhaps the plot of “A Murder Is Announced” was not that simple, especially since involved family conflicts, a great inheritance and greed. I do know there have been one stage and three television adaptations of the 1950 novel. One of the TV adaptations aired on NBC’s “THE GOODYEAR TELEVISION PLAYHOUSE” back in 1956. The second TV adaptation aired on the BBC series, “MISS MARPLE” and starred Joan Hickson. 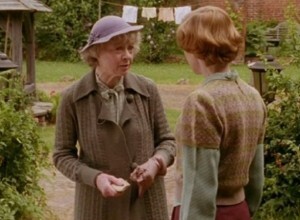 And the third adaptation, Geraldine McEwan, aired on ITV’s “AGATHA CHRISTIE’S MARPLE” back in 2005. This article is a review of the 2004 adaptation. I noticed that screenwriter Stewart Harcourt made a good deal of changes from Christie’s novel. And yet . . . “A MURDER IS ANNOUNCED” did not suffer from these changes. Certain characters were deleted from this adaptation. Laura Easterbrook, wife of Colonel Archie Easterbrook did not appear in this story, making the latter a divorced man. This scenario also allowed Harcourt to create a romance between Easterbrook and the widowed Mrs. Sadie Swettenham. As for the latter’s young son Edmund, his literary romance was nipped in the bud due to his opposition against his mother’s romance with the alcoholic Colonel Easterbrook. That is correct. Colonel Easterbrook is an alcoholic in this story. Two other characters deleted were the Reverend Julian Harmon and his wife, Diana “Bunch” Harmon. This proved to be something of a problem, considering that in Christie’s novel, Miss Marple stayed with the Harmons during her visit to Clipping Cleghorn. In this adaptation, Miss Marple stayed with farmer Miss Hinchcliffe and her companion, Amy Murgatroyd. Miss Murgatroyd, like the literary Mrs. Harmon, was her goddaughter. Also, Harcourt made it slightly more apparent than Christie did that Miss Hinchcliffe and Miss Murgatroyd were also lovers. Aside from these changes, Harcourt’s adaptation of the 1950 novel was faithful. And yet . . . Harcourt’s changes did not harm Christie’s novel one bit. Perhaps the reason why his changes did not have a strong and negative impact was due to them being quite minor. Creating a slightly different romance along with deleting two minor characters simply did not have an impact on Christie’s story. Thank God. “A MURDER IS ANNOUNCED” has always been one of my favorite novels written by the author. The idea of a movie or television screenwriter inflicting major changes upon its narrative would have been abhorrent to me. In “A MURDER IS ANNOUNCED”, Miss Marple and Detective-Inspector Craddock discovered that Miss Blacklock had been a wealthy financier’s secretary before the war. Following Randall Goedler’s death, his widow inherited his money. However, Mrs. Goedler is dying. But since they had no children, Goedler left his money to Miss Blacklock in the event of his wife’s death. The will also stipulated that if Miss Blacklock should die before Mrs. Goedler, then the children of Goedler’s estranged sister – Pip and Emma. Due to the upheaval nature of British society during the post-war years, neither Miss Marple or Inspector Craddock know who Pip or Emma are. Or for that matter, their mother, Sonia. Either two or all three might be residing at Chipping Cleghorn, waiting for Belle Goedler’s death and ensuring that Miss Blacklock will die before it happens. “A MURDER IS ANNOUNCED” is one of those rare Christie stories in which the story’s time period has such a major impact upon it. And despite the changes regarding some of the adaptation’s characters, Harcourt never changed the core of the teleplay’s narrative. Do I have any complaints about “A MURDER IS ANNOUNCED”? If I must be honest . . . not really. Well . . . perhaps a few minor ones. A part of me wish that Harcourt had expanded a bit more on Miss Marple’s conversation with Dora Bunner, Miss Blacklock’s companion and old friend, at a local tea cafe. A part of me felt as if enough had been said. I also wish that Harcourt had utilized the role of Miss Blacklock’s maid, Mitzi, just as Christie had did in the novel. I found the literary version of Mitzi’s role in the murderer’s exposure very dramatic. It seemed that the drama of that moment had been cut by Harcourt’s screenplay. In fact, I would add that that the teleplay’s last ten to fifteen minutes struck me as a bit rushed. A part of me wish that this adaptation had been a little longer than 94 minutes. Another aspect that made “A MURDER IS ANNOUNCED” work for me were the performances featured in the production. The teleplay marked Geraldine McEwan’s fourth outing as Miss Jane Marple and she did an excellent job in conveying the character’s intelligence and subtle sense of humor. However, I was especially impressed by the actress in a scene that featured Miss Marple’s discovery of a third murder victim. There were four other performances that I regard as first-rate. The first came from Zoë Wanamaker, who gave a superb performance as Letitia Blacklock. Wanamaker did an excellent job of conveying her character from a competent retired secretary to a beleaguered woman who becomes increasingly paranoid over the threat of being killed for a great fortune. The second excellent performance came from Robert Pugh, who was excellent as Archie Easterbrook, the alcoholic former Army officer battling his demons, romantic desire and loneliness. Cheri Lunghi also gave a superb performance as Colonel Easterbrook’s object of desire, the lonely widow Sadie Swettenham. One of my favorite characters from Christie’s Miss Marple novel was the police investigator, Dermot Craddock. Just about every actor who has portrayed Craddock has done an excellent job. And that includes Alexander Armstrong, who portrayed the police detective in “A MURDER IS ANNOUNCED”. I was surprised to learn that Armstrong is basically known as a comedian and singer in Great Britain, especially since he gave such a strong performance as the no-nonsense Detective-Inspector Craddock. However, the television movie also featured excellent performances from the rest of the cast. They include performances from the likes of Keeley Hawes, Frances Barber, Claire Skinner, Elaine Page, Matthew Goode, Sienna Guillory, Christian Coulson, Virginia McKenna, Catherine Tate and Richard Dixon. And if you are patient, you just might catch Lesley Nicol of “DOWNTON ABBEY” in a small role. I can honestly say that I did not come across one performance that I would consider questionable or merely solid. Overall, I did not merely enjoyed “A MURDER IS ANNOUNCED”. I loved it. Yes, I thought its running time could have stretched a bit past 94 minutes. But I thought screenwriter Stewart Harcourt and director John Strickland did an excellent job of adapting one of my favorite Agatha Christie novels of all time. And both were ably supported by a first-rate cast led by the always talented Geraldine McEwan.